All items are handmade and are one of a kind from foraged wild and domesticated plants. I collect whatever is in season on my daily walks, usually in the Philadelphia area. The composition of my pieces range from traditional (using whole, pressed flowers and leaves) to more abstract. Each piece involves laying jewelry-grade resin in several layers, over several sittings. 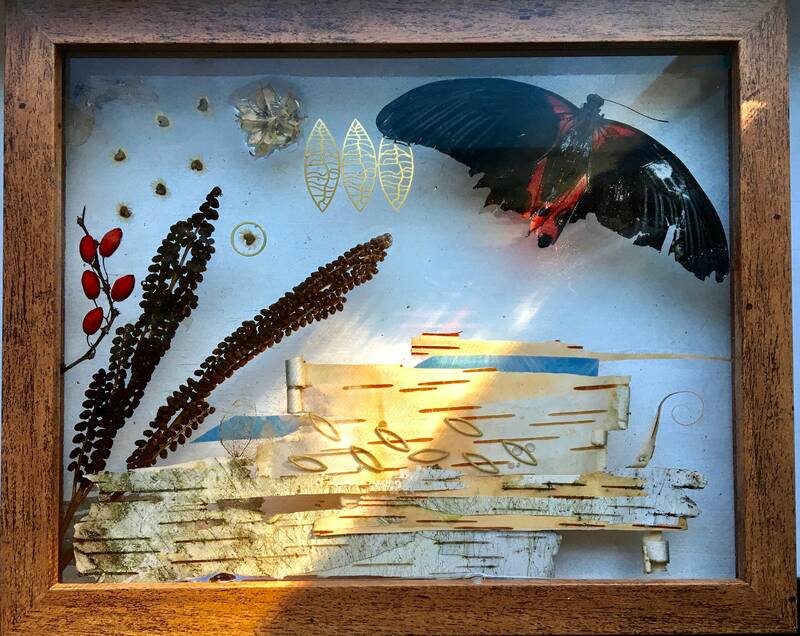 8 by 10 shadowbox filled with about 4-5 layers of epoxy resin with collaged layers of birch bark, handmade cyanotype, brass, barberry, winter fern fronds , and what I think is a red scarlet swallowtail butterfly (sourced ethically from a naturally deceased specimen from Philadelphia's Insectarium). Can be hung on a wall, or placed upright on a flat service or window ledge.